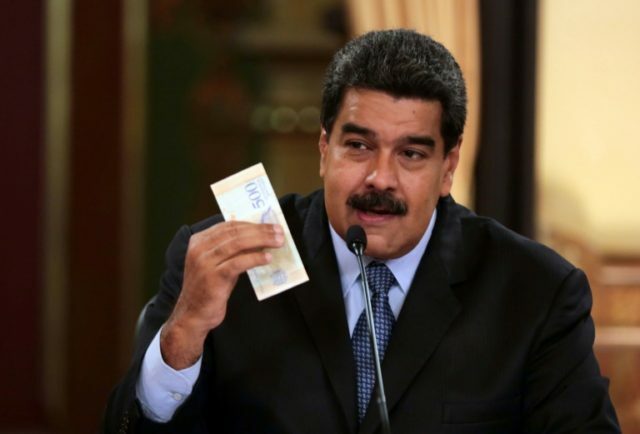 Under the new measures, Maduro has created what is known as the “sovereign bolívar,” a parallel currency to the main bolívar, that slashes five zeroes off the country’s currency. The official exchange rate for the bolívar will rise from about 285,000 per dollar to 6 million per U.S. dollar, roughly in line with its true market value, while the government has also raised the monthly minimum wage by 3,500 percent to the equivalent of $30 a month. Prior to this change, hyperinflation drove people’s wage packets down to as little as one dollar a month. In his announcement on Friday night, Maduro said that the government would cover minimum wage increases for businesses for up to 90 days as they adjust to inflation. The move is expected to spiral inflation further out of control. Economists from the International Monetary Fund warned that inflation could exceed one million percent this year, meaning the highest denomination note currently worth $6 could be worth just $0.20 by the end of the year. Many business owners are now fearful of not being able to pay their employees without steep price hikes that will prove unaffordable for the majority of people. In response to the measures, opposition leaders have called for a nationwide strike and mass demonstrations against the Maduro regime, over a year after the country’s large-scale protest movement collapsed. It is not the first time that Venezuela’s regime has decided to cut multiple zeroes from their currency as a response to hyperinflation. In 2008, the late socialist revolutionary Hugo Chávez created what is ironically named the “strong bolivar” by stripping three zeroes off the currency, although the move only worsened hyperinflation in the long run.